The boy went to school as usual and I must say, it was quite an eventful week for him too. He got bashed at by his classmate for trying to be helpful. According to the teachers, he merely wanted to help his friend keep his toys but his friend refused his help and lashed out at him (his face, to be exact). My boy reacted by hitting back (good job) but I think he probably received more bashings thereafter and that was when he started to crying. My heart broke upon hearing the teacher narrate the scenario, and to be honest, I’ve never seen him coming out of school looking so sad. I can’t imagine how it was like to have him receive a hit from his friend, and all because he wanted to help. I can’t imagine him hitting at his friend too – his small little hands and fingers trying to do a punch of sorts. It’s really interesting how children learn to be defensive from young, and how they can actually feel and understand what it means to be unfairly accused and suffer from unjust. They just can’t express themselves yet, and that’s what makes my heartbreak even more painful. Anyway, back to the main topic for this post. This is a very simple recipe to feed a small family of three, served with rice and lots of love. I have nothing much to say about it though, since it’s pretty straightforward. I hope you’ll like it as much as I do. Mix minced pork, water chestnuts, soy sauce, Shaoxing wine, sugar, white pepper, corn flour and sesame oil together. Place pork mixture onto a steaming plate, pressing down evenly. Create an indent in the center. 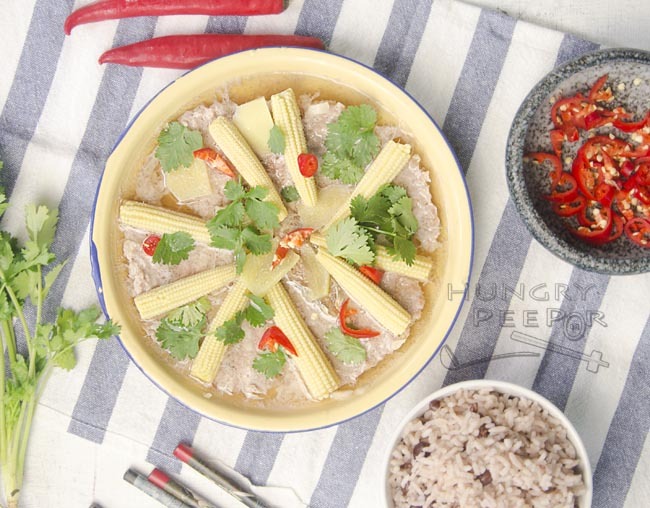 Place salted fish into the center. Place baby corns onto minced pork, distributing evenly in a circle. Place ginger on top of mixture. Lastly, add water into steaming plate. Steam on high heat for 15min. Garnish with red chilli and coriander. Serve hot with rice. I’ve added water into the dish at Step 5 to steam with the mixture. The water absorbs the saltiness of the dish from the salted fish during the steaming and becomes a nice stock to accompany the rice. You can substitute baby corns with other favourite ingredient of yours e.g. carrot slices, broccoli, cauliflower etc. It’s as flexible as you want it to be! This entry was posted in Chinese, Pork and tagged Salted Fish, Steaming. Bookmark the permalink.